Our popular Term 4 Small Group Training (SGT) courses are open for registration, just in time for Spring! These courses are open to everyone (no membership required), so if you’re looking for a bit of extra motivation during your work week, we might have the perfect solution for you, just over the other side of University Drive! Short 6 week fitness courses, focusing on a specific fitness/mind body discipline. E.g. Boxing, Bootcamp, Yoga etc. Our experienced instructors work with you, along with the same small group of people each week in a supportive and energising environment. 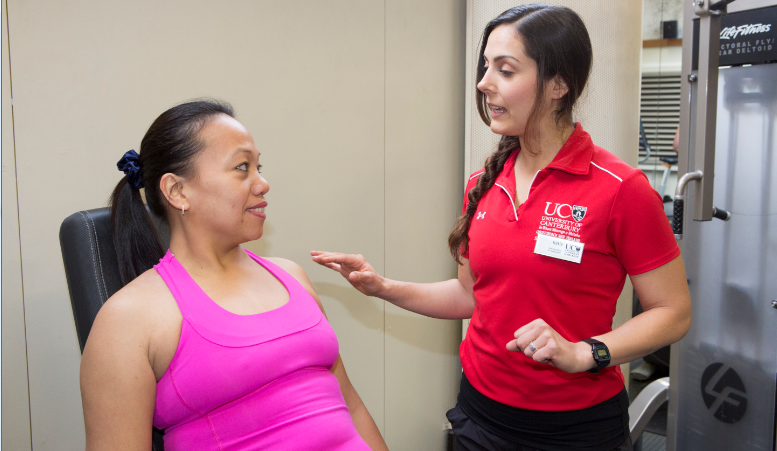 Workouts can be individualised to suit you and your experience, due to the small class size. A great way to remain accountable and motivated to reach your health and fitness goals. What’s on offer for Term 4? To discover more, click on the courses above. All sessions are held at the UC RecCentre and commence from week 2 of Term 4. Just pop into see the Rec Centre reception team, or give us a call on ext 92433 and you can sign up over the phone. Meditation Mondays – free at UC! Ever wondered how to meditate? Whilst there are a plethora of free meditation apps and videos on you tube, sometimes it’s just nice to have the comfort of a real teacher there to guide you, and answer your questions at the end of your meditation. 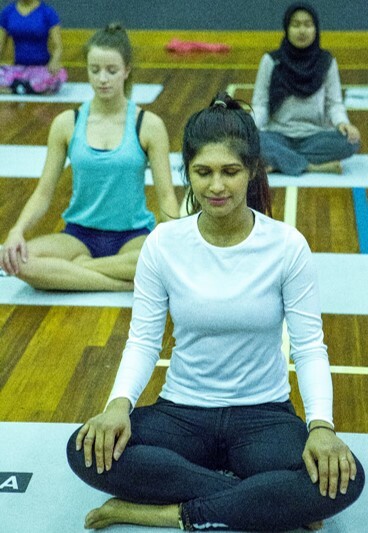 There are a range of meditation techniques out there, and we’ve lined up our yoga teacher Saskia Tranter, to offer 2x 20min guided meditation sessions. There is no cost to participate, and you don’t have to be a member of the RecCentre to join. UC Students and Staff will have priority if we run out of space. Every Monday throughout term time, beginning Monday 16 July for six weeks. You don’t need to come to every session, just the ones you can make. Sessions start at 12pm and 12.30pm, and will be held in Rm 210, Puaka-James Hight. Sessions are capped at however many we can safely fit in the room, so do arrive early to get your seat. Relaxation is number one! Studies on the relaxation response have shown various short-term benefits to the nervous system including lower blood pressure, improved blood circulation, lower heart rate, slower respiratory (breathing) rate, less anxiety, more feelings of well-being, less stress, and deeper relaxation. It’s worthwhile noting that the purpose of meditation is not to achieve benefits, but to simply be present. 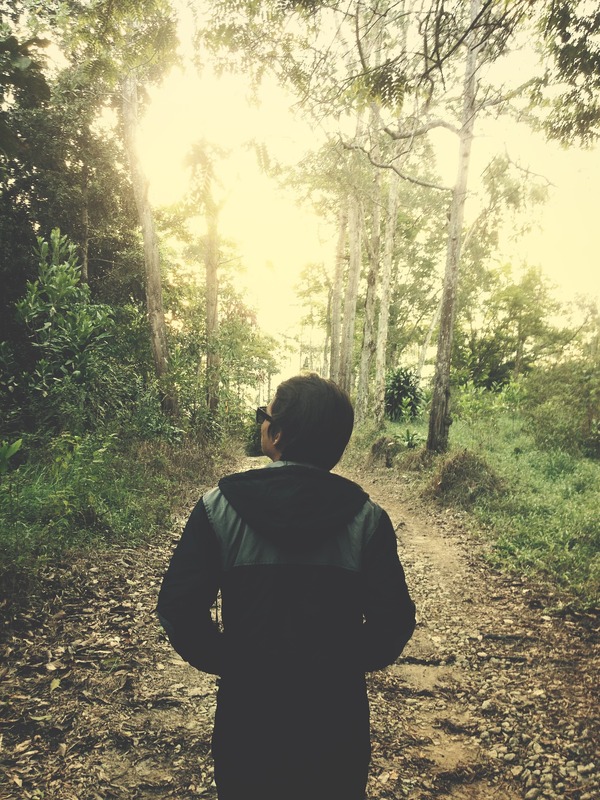 Out of being present, we may find that these benefits come. What is a Personal Trainer (PT) good for, and do you really need one? In all honesty, not everyone needs a PT, but they can certainly help those of us who struggle with motivation, knowledge or boredom in the gym. Why should you get a trainer? 1. It’s educational. We all love education right? If you want to learn to change the oil in your car, you don’t go to a hairdresser, and relying on unvetted Youtube or Instagrammers can be risky. The best option is to find a qualified trainer who can work out a plan to suit your lifestyle and achieve your goals. It can also help prevent injuries or overtraining woes, which may slow you down. 2. Accountability. 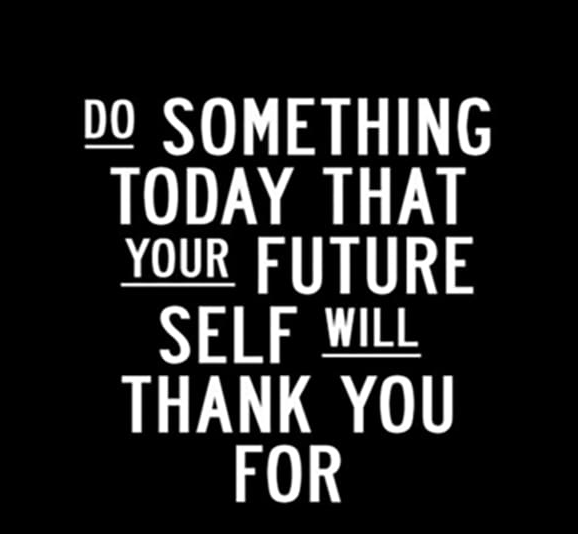 How many times have you procrastinated or said ‘tomorrow’? With a trainer, you’ll have a scheduled appointment for your diary to motivate you to turn up. And they’ll keep tweaking your programme to ensure it’s still challenging and intrinsically motivating for you. 3. Time management. With little spare time, it’s crucial that we find time to work on our own health and wellbeing. A trainer can help you maximise your time, so that you get the best workout in the time you have available. 4. It’s just more fun! Not having to think about what’s coming up next in your routine, and just letting the trainer guide you can be freeing and relaxing (all whilst working up a sweat). They can come up with fun and interesting ways to achieve your goals, without going to ‘standard’ exercises that are easier to remember on your own. They generally have good banter and charming personalities, which makes a 45min sweat session that much more enjoyable. If any or all of these points resonate with you, then maybe you could do with a trainer? Good news is, starting Monday 11 June, we have an amazing 1 month Introductory training package available to all UC Staff. We’re offering 1 full month of RecCentre Membership PLUS 4x PushMe personal training sessions for just $99. Why are we doing it? Because your health is important, and we know that budget can be another constraint, so let’s remove that and get you off to a good start. At that price, you can afford to give it a whirl, and see if it’s right for you. Hurry, the special ends on Saturday 30 June, 2018, and you must bring your current Staff ID card to sign up at our reception (not available online). Visiting staff can take advantage of this too! Finally, just note that this offer isn’t available in conjunction with other discounts, like discount vouchers or union membership discounts. 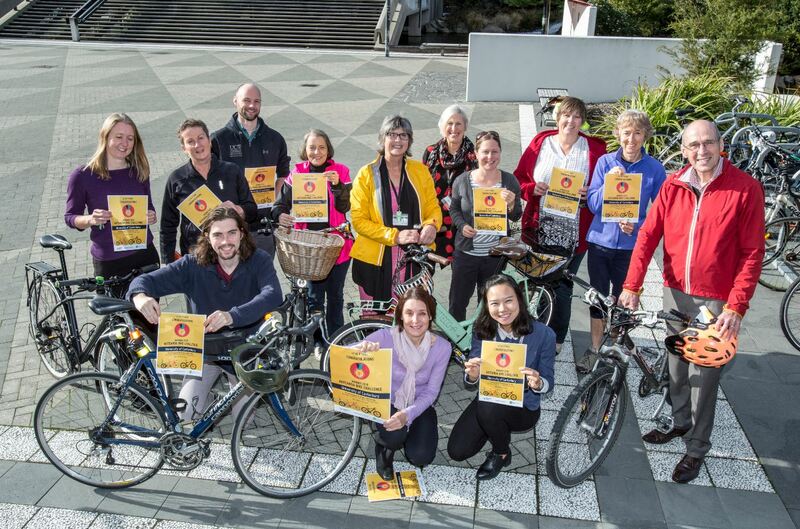 The UC team received third place in the Aotearoa Bike Challenge for the 500-1999 staff category in Christchurch. I signed up with Love to Ride Christchurch for the 2017 Aotearoa bike challenge and noted that UC did not have a registered team. As I was wanting to make sure that my logged rides would count for something I set up UC and became the “Challenge Champion”, it was then up to me to encourage members of the UC staff to join up as well. 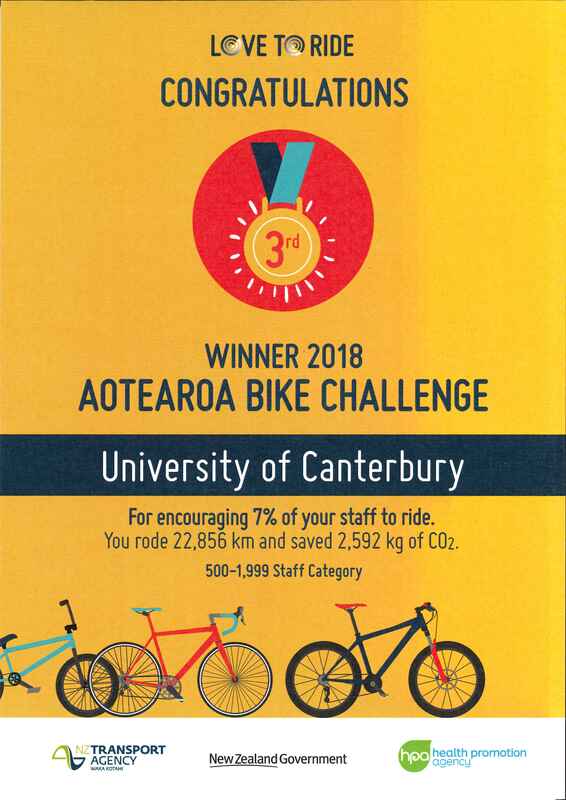 The Aotearoa Bike Challenge ran from 1 – 28 February 2018, we currently have 115 out of 1764 staff registered within 35 different departments, we were still able to reach 3rd place for Christchurch. see progress when logging rides, for the challenge and also on an every day basis using automatic uploads via the Ride Report app. Having recently purchased an E-bike (and not paying for car parking) I am now committed to commuting to work (20km round trip) by bike as much as possible. I am new to Christchurch, new to UC and new to cycling to work. I made the decision to capture the freedom of my youth and attempt to cycle the 10km journey to and from work. Encouraged by the wonderful Connie of Go Cycle Christchurch, and a very bike-friendly work colleague, Dawn, the next logical step was to take part in the Aotearoa Bike Challenge. In such a large organisation like UC, it has given me contacts with other cyclists across campus. Achieving small goals like exceeding my previous weeks kilometres became ridiculously fun and addictive! I have saved money on petrol and increased my overall fitness. The website was user friendly and a great way to check in to see how UC was faring against our competitors across the city. I am proud that UC came third in the competition, and encourage other UC staff to join next year. It’s free and there are seriously good prizes on offer! 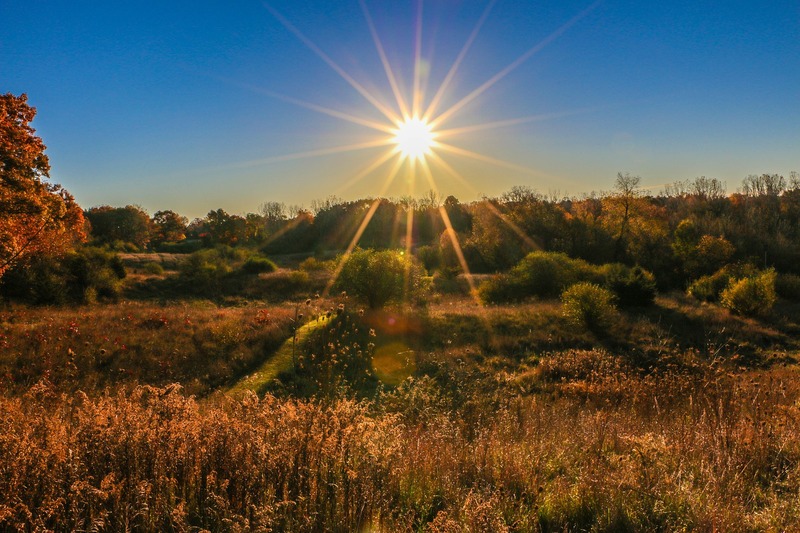 UC Health Centre nurse Wendy Risdon says the sun’s rays are free and essential for life – and there is research which supports the need for some sun exposure in winter. You would be excused for thinking all you need to do to stay well this winter is have a flu vaccination. How about the virtues of good old soap and water when handwashing and a daily dose of sunshine? The sun’s rays are free and essential for life. It is the sun on bare skin that creates vitamin D which strengthens the immune system and is essential for the regulation of hundreds of body processes. It is hard to obtain enough vitamin D from dietary sources alone though there is some in fatty fish, egg yolk, organ meats or cod liver oil, the best utilised source is the sun. This is a reason to leave your office or work place at lunch time because in winter UVB rays aren’t strong enough in the early morning or late afternoon to trigger vitamin D production, only at midday or when the sun is at least 30 degrees above the horizon. This happens to be the exact time some experts tell us to stay out of the sun! You need 10-30 minutes of sun exposure, depending on skin pigmentation, in the middle of the day. This can improve mood, help depression and actually decrease cancer risk. It can also help with fat loss, building muscle and blood sugar control. So where is my evidence? A recent review, led by the Queen Mary University of London, looked at 11,321 people across 25 separate trials in order to see if there was any definitive correlations present in this regard. These studies looked at a range of infections, from common cold strains to full-blown influenza. They came to the conclusion that, for every 33 people regularly taking Vitamin D supplements as part of a balanced diet, one of them would not experience a cold or flu infection during the year. This would make it more effective than the flu vaccination. Overall, extended to the entire UK, this works out to be three million people without the sniffles. This would not just be great for their own health, but would be a huge boost to the British economy in terms of work hours not lost to sickness. I am sure we could extrapolate this out to have a similar impact in New Zealand. If you can get outside regularly around midday, in winter and spring you don’t need a Vitamin D supplement, but if you are office or library bound, day after day, you are likely to be low in Vitamin D and susceptible to colds and flu’s and other respiratory illnesses. So my winter wellness tip is to take regular small doses of sunshine and watch your health improve.